From Haider Ackermann’s deconstructed kimonos to Viktor & Rolf's play on shirting and Comme Des Garcons' upside-down jackets - creating couture by changing scale deconstruction and re-appropriating clothing was a recurring theme throughout the Spring Summer 2011 collections. Harnessing was another key detail throughout the S/S collections which was used to accentuate and create new shapes, structuring feminine fabrics, with Alber Elbaz at Lanvin using them to give structure to flowing gowns and for Jean Paul Gaultier's final Hermes collection, where he used them in abundance to detail and structure many looks. Other favourite moments from the Spring 2011 collections included the revisit to Kenzo's incredible archive, where dainty models wrapped and bound with a plethora of prints like little porcelain dolls was a feast for the eyes, in statuesque and practically subhuman sculptures made of fabric. Miu Miu's giant rodeo prints on over-sized 80s leather jackets were a refreshing take for the ever popular and over-exposed era -we have come to expect exciting twists from Ms Prada. Tasteful laser-cut bags and shoes teamed with pleated screen-print silk dresses were the perfect accompaniment to the insane soundtrack of a reality TV megamix featuring the X Factor theme tune and Cheryl Cole voiceover. 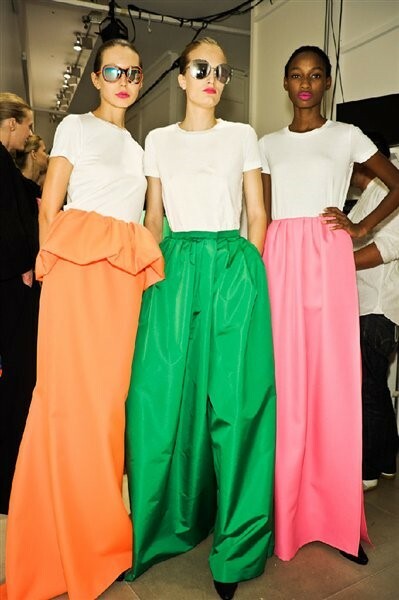 Raf Simons for Jil Sander's contrasting use of long brightly coloured voluminous skirts with simple white t-shirts anticipated the summer spirit with sheer perfection - a simple yet bold statement set the standard for the remainder of fashion week. A comical view on the plastic shopping bag, satirically transformed with such ease into the statement bag of the season. Colour was also a big influence in Prada's collection as navy blue with white stripe and bright green fur stoles were carried down the catwalk, contrasted beautifully by the multi-layer stacked shoes and variation upon variation of graphic and organic prints - the antithesis of minimalism. Martin Margiela's black plastic vacuum packed black dress was a welcome and successful injection of experimentation, with exaggerated boxy coats and tops with trousers stiffly sitting inches away from the models waist. Whilst Dolce & Gabbana's white lace overload illustrated romanticism at it's best, taking a step away form the sickly sweet by teaming large gold hoop earrings with the floaty dresses and of course the classic Dolce body. Sarah Burton's debut collection for Alexander McQueen proved to be an eclectic but inspiring mix of ideas, particular favourites being the organic back to nature looks of corn weaved corsets with intricate feather dresses and butterfly print gowns. These incredible structures created, paid tribute to Ms Burton's empathetic yet progressive translation of the McQueen brand. A London Fashion Week highlight and much talked about show was Meadham Kirchoff, where the use of colour and fabrics, attention to the tiniest detail, show space and insane hair tie dye, all combined to make it one of the most memorable and inspiring collections to come out of London this season, despite the level of competition. Other London highlights included Mary Katrantzou's collection. Her Italian fresco painting and photorealism of retro interiors and lampshade dresses pushed the brand even further into the forefront of London based design talent. And J.W. Anderson's Swarovski studded boots - a beautifully impractical work of art in their own right.